This is day 4 of the 31 Day Challenge To Optimize Your Blog With Social Media. Yesterday we spoke about measuring stats on your blog. Today we’ll be gathering some stats on where you’re at on Twitter. In two weeks we’ll discuss how to analyze your network more deeply to build specific strategies. For now, we want to set a baseline so you can measure growth over the next 2, 3 and 6 months. This number indicates reach. Your followers number is the number of people that have shown on interest in your Twitter stream. Track how your follower numbers grow by jotting it down every month or so in an excel spreadsheet. You’ll notice the more followers you gain, the faster this number will grow (to a point). Keep in mind that some of these folks only followed you in hopes that you’d follow back and may not be part of your actual community. This number has meaning when put next to your followers number. Are you following more people than the number of people following you? If so, you might want to look at adding more value on Twitter. If you’re new on Twitter, keep in mind that this number might be higher than your follower number. That will change with time and effort. This number indicates the amount of value you create for others on Twitter. Look though the lists that people have put you on to see how people perceive your contribution on Twitter. 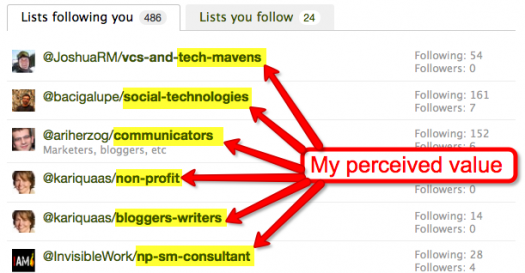 For example, if you look at the lists I’m on, most of them have to do with non-profit social media topics. 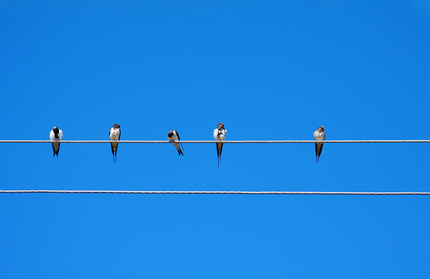 Measuring your network and your impact can be done in a number of ways (and with a number of tools), but remember, you simply want to document where you’re at on Twitter right now. Two tools make it easy to measure your impact. Both are free. Network overlap: This graph shows you the level of two-way conversations you have with folks. 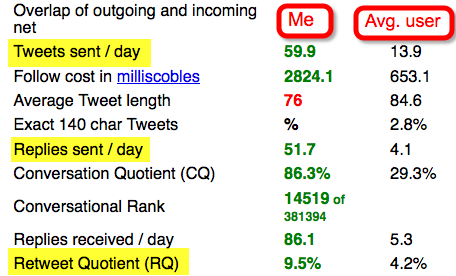 Retweet Quotient: This tells you what percent of your tweets are retweeted by others. Twitter Grader is a free tool from HubSpot that grades your use of Twitter and offers recommendations for improvement. Of course, a computer won’t take into account the nuances of your blog strategy, you can get a few useful suggestion, and a grade of your use of Twitter from 0-100. Tweetmeme is a tool that allows you to analyze how people are talking about your content on twitter. You need to set up an account with Tweetmeme so you can view the analytics directly in WordPress (download this free overview of Tweetmeme’s reporting). Homework: Capture these 6 sets of Twitter stats in an excel spreadsheet. Update as often as you like, but at least note the date when you collected today’s homework. Hey! There is a brand new "tool" specifically for nonprofits and social media! I would love to get some feedback on it!